Minnie Mouse with squeaker and rustling foil is only avialable in Germany, France, Portugal, Spain, UK, Austria and Switzerland. A world-wide star. One of the true greats to this day: Minnie Mouse. Mickey Mouse’s girlfriend. She’s so cute and lovable. 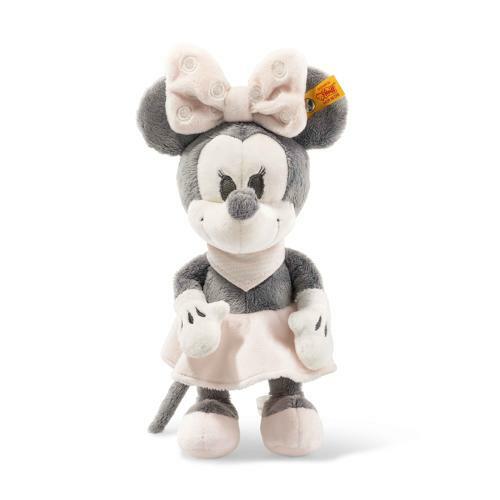 Steiff’s fashion conscious Minnie Mouse measures 23 cm and is made of extra soft plush for soft baby skin. The embroidered eyes sparkle in the beautiful colour grey. The smiling mouth is also embroidered. The funny round grey ears are filled with rustling foil. The head is wrapped in a cute pink ribbon stitched with white dots. The pink and white striped neckerchief is sewn on and fits so well with the pink skirt and pink shoes. When your child presses the soft tummy, the squeaker squeaks. Minnie Mouse is simply great – for cuddling and snuggling, playing around with and having fun. And your little darling can grab onto her hand clothed in white cuffs with grey stitching.